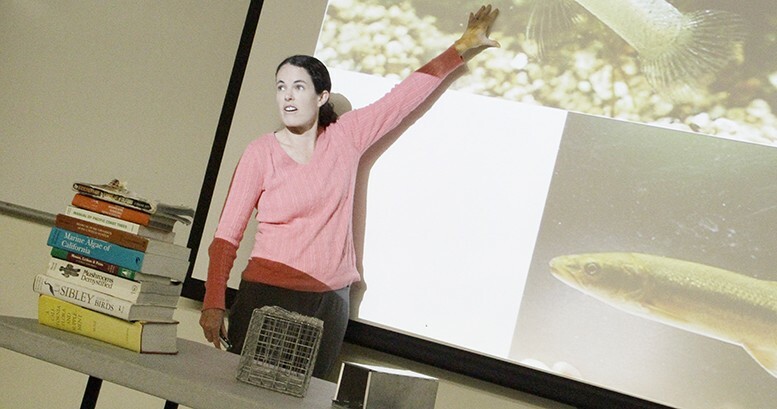 Biology professors Rick Topinka and Kathy Bradshaw joined with natural resource department colleague Jennifer Neal to discuss the biological diversity on campus and introduce students to a new phone application for nature enthusiasts Tuesday. Topinka, who hopes to get students excited about the various organisms at American River College, opened the discussion by speaking about biological diversity and BioBlitz. Bradshaw, who spoke after Topinka, discussed lichens, a type of fungus created by two separate organisms, typically one fungus and one non-fungus, that undergo symbiosis, an interaction that occurs when the organisms live in close physical association. According to Bradshaw, ARC included about 14-15 different types of those species. Bradshaw also encouraged students who wanted to be naturalists to use the iNaturalist application, a phone program that allows the user to upload information about observations they discover. Neal wanted to raise awareness for the environment amongst the students with her speech. “(I want) to let people know how much life there is and to generate interest and concerns for the living environment,” said Neal. Travis Carrigan, president of the Environmental Council of Sacramento, was present. Carrigan commented on what he took away from the speeches. “I definitely liked talking about mammals,” said Carrigan. Be the first to comment on "Professors catalog biological diversity across campus"